Certainly you and I have not had it as bad as the folks in Louisiana these past few days. In fact, I recently heard that something like 30,000 people had to be rescued from their homes by boat. There are storms, and then there are Storms, capital “S”. And in today’s Gospel, it is the latter. The wind was contrary. And, as it says in the text, the boat was being tortured. The wind was contrary and the boat was being tortured. This, of course, was not the first storm for these disciples. Just six chapters earlier, as Matthew says, “a great tempest arose on the sea.” Same intensity. Same fear. Same capital “S” kind of Storm. So what makes this storm so different from that storm? What makes this storm so different is that, back then, Jesus was in the boat, but today, he is in the water. “He cast them directly into a situation in which they would have a greater longing for him.” That puts a whole new perspective on this Gospel, does it not? And, of course, it puts a whole new perspective on our own lives, our own struggles, our own fears, and our own storms. They are all different, yes. Your storm is not my storm is not their storm. But they are all storms. And to each of us, the wind is “contrary.” To each of us, the tiny boat of our own lives is being tortured. But that’s why it’s important to remember that, amid all of these storms, amid the rough waves and the gusting wind, amid all of that, we need to be, not in our own little boat, tossed about by every trouble that comes our way, but we need to be in the ark—the ark like Noah’s ark, the ark that made it through the flood, the ark that saved eight souls, giving us a picture, a symbol, a hint of how God would save us all. 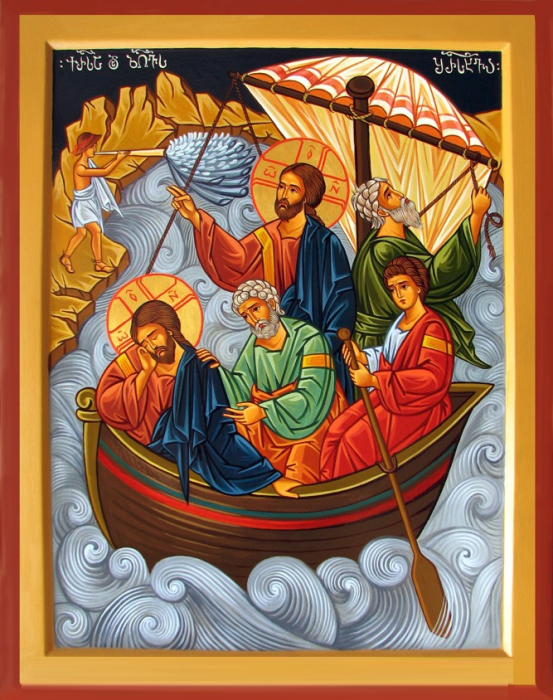 Dear brothers and sisters, amid the storms of life, we need to be in the boat of the Church, the very ark of our salvation. For it is here, and only here, in regular contact with Christ and His gifts; it is only here, and only here, the most important place in all the world; it is here, and only here, that we can be saved. It is only here that our storms can be calmed and, most importantly, that we can grow and mature and become the kind of people, the kind of Christians, that Christ created us, called us, and died for us to be. “the devil strives to keep the wind from calming down,” he says, “but greater is he who is persistent on our behalf […]. He comes to us and strengthens us, so we are not jostled in the boat and tossed overboard. For although the boat is thrown into disorder, it is still a boat. It alone carries the disciples and receives Christ. […] Therefore stay inside the boat and call upon God. […] When all human help and strength have been abandoned, the only recourse left for the sailors is to cry out to God” (Sermon 75.4). And will he not, asks Augustine, come to our aid as well? Indeed, he will. For he, alone, is good and loves mankind.